The Dan Willard Big Band began with Bob Solow, a physician and saxophone player who formed a big band in the Culver City area. His son, Bruce played trombone in the band. When his father passed on, Bruce, who had relocated to Ojai, inherited the music library. In 1993, along with a few other members of The Ojai Band, Bruce assembled the first incarnation of the big band calling it The Bruce Solow Big Band. This band rehearsed at Nordhoff High School and included the high school’s music director, Bill Wagner. Soon afterward, the band broke up but reformed and began rehearsing at the Ojai Valley Wesleyan Church. Sadly, Bruce died of cancer in 2001 at the age of 46. The band continues under the direction of Dan Willard, a professional musician and music teacher who moved to Ojai from L.A. in 1992. 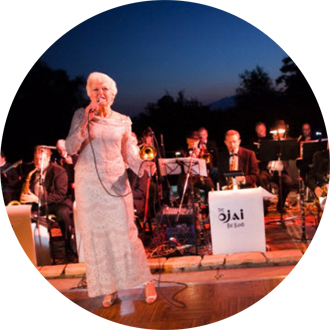 The band includes one of Ojai’s living legends, Jimmy Calire on sax as well as vocalists Jan Nelsen and Eric Harrington. The full band is comprised of 17 musicians plus the 2 vocalists. The band can also be scaled down to as few as eleven musicians to accommodate your budget or room size.